On your busiest weekday nights, the last thing you want to think about is getting dinner ready when you come home. The Oster® Oskar™ 2-in-1 Salad Prep & Food Processor makes meal prep a breeze. It will shred, chop and dice to perfection to get you out of the kitchen and at the dinner table faster. This recipe is great for any busy weeknight because you can use store-bought rotisserie chicken and instant rice or even substitute the cream mixture for cream of mushroom mix. It's great for the family because it puts a unique spin on the traditional chicken and rice casserole by adding in a few delicious, hidden vegetables. Pair with a garden salad or other vegetables to give this meal the extra healthy boost your body needs. Fill a saucepan with 5 cups chicken broth. Add wild rice and bring to a boil over medium-high heat. Reduce the heat and cover. Cook until rice is slightly tender, around 35 to 40 minutes. Preheat oven to 375 degrees. Meanwhile, dice mushrooms, onion, carrots and celery in the Oster® Oskar™ 2-in-1 Salad Prep & Food Processor and set aside. Boil broccoli florets in a small saucepan for 2 minutes and immediately plunge them into a bowl of ice water to stop the cooking process. Remove from ice water and set aside. In a large skillet, melt butter. Add diced vegetables and cook until mostly tender. Sprinkle flour over vegetables, stir to incorporate and then pour in the remaining 3 cups of chicken broth. Bring mixture to a soft boil and let it thicken. Add in heavy cream and let mixture cook until it thickens. Season as needed. Mix cooked rice, shredded chicken, broccoli and vegetable-broth mixture in greased baking dish. Melt remaining tablespoons of butter and mix with panko breadcrumbs. Sprinkle mixture over the top of the casserole. Cover with foil and bake for 20 minutes. Then, remove foil and continue baking for another 15 minutes. Serve, top with chopped parsley and enjoy. 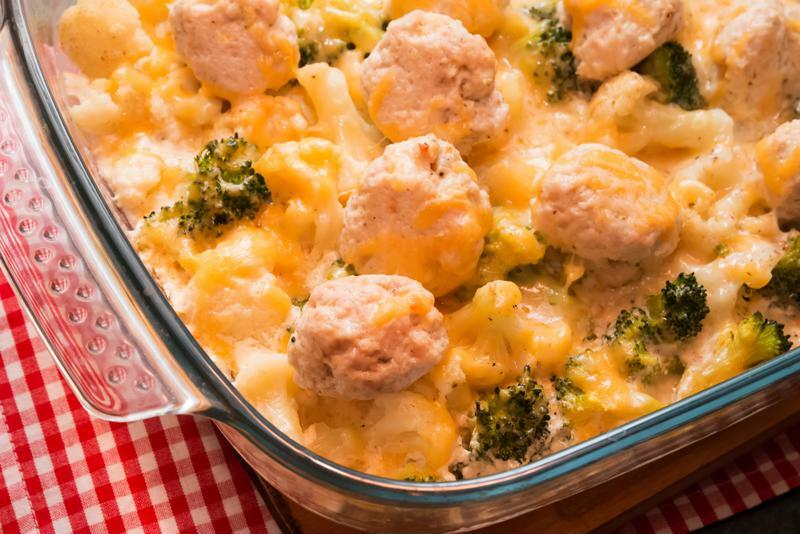 What kind of casserole should you make during your busiest workweek? This meal is simple, satisfying and perfect for any chaotic weeknight meal. From work meetings to parent-teacher conferences, you have a lot on your plate, which is why this recipe is the ideal choice for any busy professional or family. Pair with roasted asparagus or other fresh vegetables to make this dish even better. Preheat your oven to 375 degrees. Dice onion in the Oster® Oskar™ 2-in-1 Salad Prep & Food Processor and put aside for later. Warm skillet on medium-high heat. Heat up olive oil in pan and add onion and sausage. Cook until browned, then add garlic and sauté for 2 minutes. Pour in chicken broth, brown sugar, tomato paste, dried thyme, seasoning, beans, bay leaf and beans. Bring to a boil, and then cover and reduce heat. Simmer for 5 minutes and then place mixture in greased baking dish. Meanwhile, put pieces of bread in food processor and pulse until you make 1 cup of coarse bread crumbs. Sprinkle breadcrumbs over mixture and bake for 15 minutes or until browned. Serve and enjoy!